There's never been a better, easier-to-use tool for making perfect bends in ship model planking. Works on wood strips up to 2-1/4 inches wide and 1/8 inch thick...even plywood! But that's not all: it will also make smooth, no kink curves in plastic and metal strip stock and in 1/16 inch, 3/32 inch and 1/8 inch tubing and soft wire. Simply set the rollers for the desired radius and turn the crank to feed and form the material. You can even create perfect radius curves in model railroad rail from N through O scales. Precision machined of aluminum with steel gears. Rollers are 1/2 inch diameter by 3 inches long. 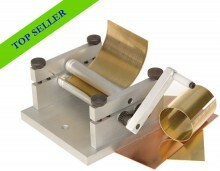 Click the button below to add the Metal Rolling Machine to your wish list.